LOS ANGELES, CA (AUGUST 28, 2014) — The American Federation of Musicians Local 47, the labor union representing more than 7,000 Los Angeles musicians, and the Recording Musicians Association of Los Angeles applaud the announcement by Gov. Jerry Brown and other state leaders affirming their commitment to expanding California’s Film and Television Job Retention Act. Members of the California Film & Television Production Alliance, AFM Local 47 and RMALA stand alongside fellow entertainment guilds and thousands of hard-working men and women up and down the state in commending the governor and a band of state legislators who yesterday confirmed that California’s film and television production incentive program will be expanded, extended, and improved through the passage of AB 1839. The bill gives the program additional funding of $330 million per year for five years, more than tripling the current annual allocation. 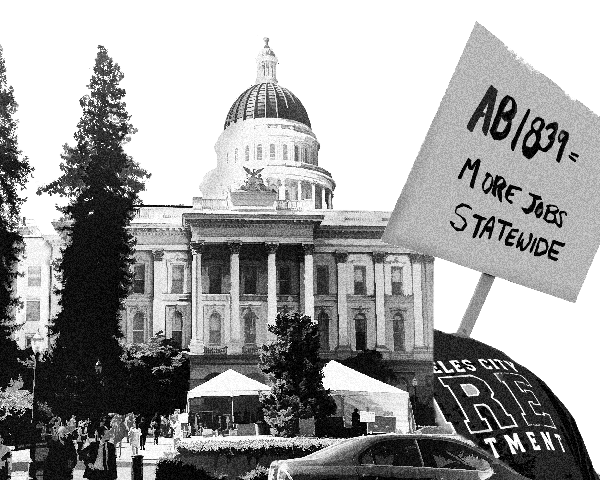 This entry was posted in Press Releases and tagged AB 1839, AFM, film music offshoring, Listen Up, Recording Musicians, RMALA, Tax Credits on August 28, 2014 by admin. Mayor Garcetti Endorses Listen Up! 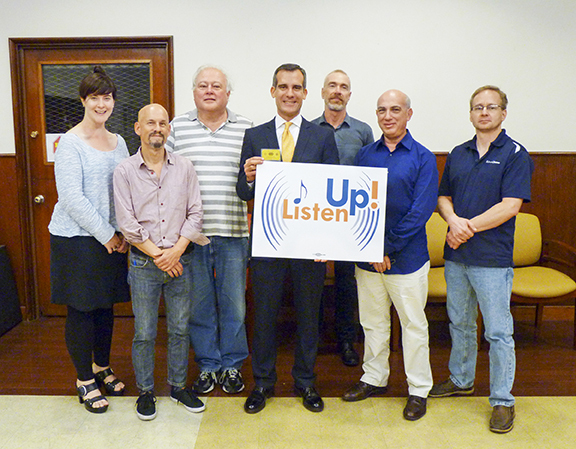 Los Angeles Mayor Eric Garcetti announced in June his support for the American Federation of Musicians’ Listen Up! campaign, which calls upon film production companies that benefit from taxpayer-funded film credits to score their films in the United States. This entry was posted in All News and tagged Eric Garcetti, film music offshoring, Listen Up, Mayor Garcetti, organizing, Recording Musicians on June 30, 2014 by admin. Momentum continues to grow for the American Federation of Musicians’ member-driven Listen Up! campaign aimed at stemming the offshoring of film scoring and bring more music jobs back to the United States. “Listen up, Lionsgate!” — The Listen Up! campaign hand-delivered more than 12,000 petition signatures to Lionsgate Entertainment’s Santa Monica headquarters May 13 calling on the company to uphold industry standards for musicians and end its practice of offshoring film scoring work. Lionsgate executives accepted the petitions but refused to meet with the musicians. Photo courtesy of Listen Up! This entry was posted in All News and tagged AFM, film music offshoring, Listen Up, organizing on June 3, 2014 by admin. “Listen up, Lionsgate!” — The Listen Up! campaign hand-delivered more than 12,000 petition signatures to Lionsgate Entertainment’s Santa Monica headquarters May 13 calling on the company to uphold industry standards for musicians and end its practice of offshoring film scoring work. Helping with the delivery were L.A. County Federation of Labor Executive Secretary Maria Elena Durazo, Santa Monica City Councilman Kevin McKeown, and Pastor Bridie Roberts of Clergy and Laity for Economic Justice. Lionsgate executives accepted the petitions but refused to meet with the musicians. SANTA MONICA, CALIFORNIA (May 13, 2014) — Today members of the American Federation of Musicians made a special delivery at Lionsgate corporate headquarters in Santa Monica of a petition signed by over 12,000 supporters of their Listen Up! campaign. Los Angeles County Federation of Labor Executive Secretary-Treasurer Maria Elena Durazo, Santa Monica City Councilman Kevin McKeown, and Pastor Bridie Roberts of Clergy and Laity United for Economic Justice were present to support the musicians and be part of the delivery delegation. This entry was posted in Press Releases and tagged AFM, film music offshoring, Lionsgate, Listen Up, organizing on May 13, 2014 by admin. AFM President Ray Hair speaks out against film-music offshoring at the Listen Up! campaign launch in Los Angeles. WESTWOOD (April 11, 2014) — Yesterday Los Angeles-area musicians held a press conference and rally across from the Regency Theatre in Westwood as part of a nationwide kickoff for Listen Up! – a campaign for fairness for musicians working in the motion picture and TV film industry. This entry was posted in Press Releases and tagged AFM, film music offshoring, Lionsgate, Listen Up, organizing on April 11, 2014 by admin.